QUINTET announces exclusive single match: Hideo Tokoro vs. Nicky Ryan! Under the unique grappling survival match rule set, QUINTET is excited to announce the addition of special single matches to take place beginning from QUINTET.3 on October 5th, the first of which will feature Hideo Tokoro against Nicky Ryan. The 17-year-old prodigy has recently caught the close attention of the BJJ world. 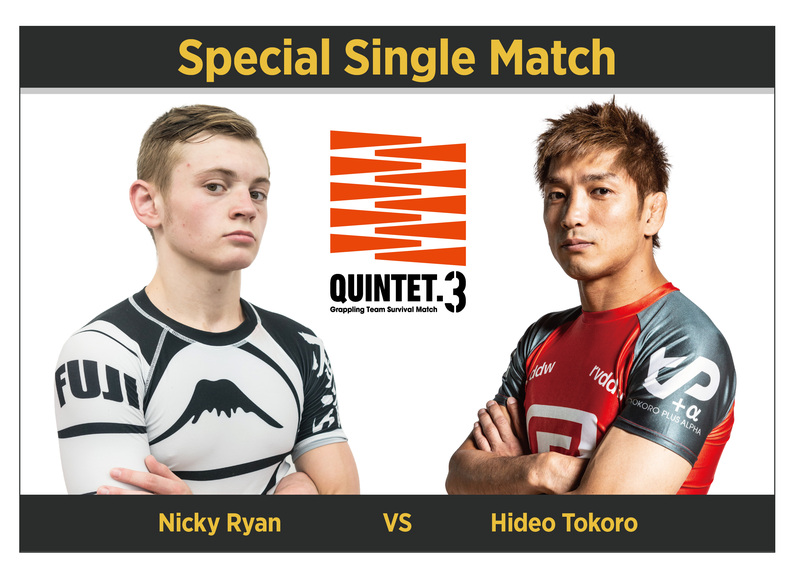 HOME > ニュースリスト > QUINTET.3 > QUINTET announces exclusive single match: Hideo Tokoro vs. Nicky Ryan! Using the unique grappling survival match concept rules trailblazed by QUINTET, audiences can expect aggressive, fast-paced grappling match ups. Bouts are set for 8 minutes, and will be decided by submission only within the allotted time. Should there be no clear winner after the duration, matches will be decided from a sudden death “Golden Score” extension in which combatants can win or lose via submission or 3 “shido” (referee cautions). The very first of these matches will serve to open the Las Vegas show, featuring Hideo Tokoro and Nicky Ryan. Having competed in all QUINTET events to date and successfully showcasing the fascinating rule set, Tokoro faces Nicky Ryan, younger brother of New Jersey Gracie Academy’s head coach, and student of John Danaher, Gordon Ryan. With a victory over none other than Geo ‘Freakazoid’ Martinez and still at the young age of 17, Nicky has very bright future ahead of him. Tokoro, the top name finisher, or the young grappling prodigy, Nicky? Expect a beautiful display of the submission arts!